Target by country row insert ads are available to large scale corporate campaigns. This advertising opportunity is suitable for the promotion of any product or service that would be of general interest to North American golfers. Row insert ad campaigns can be defined for United States and/or Canadian Where2Play listing pages. There are over 400 pages reaching a viewing audience of approximately 50,000 unique golfers per month. Row insert ads are positioned on each regional pages. 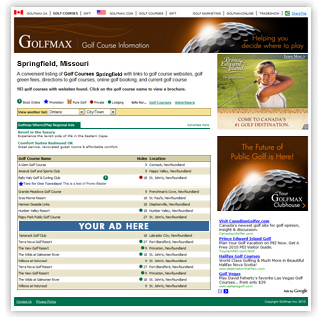 An ad is inserted after the tenth or last golf course listed on a page. On lengthy listing pages (e.g. California, Ontario, Phoenix, etc.) the ad is repeated after each 100 golf courses. Row insert campaigns must be scheduled in advance through Golfmax. Row ads must be 638 pixels wide by 35 pixels high.